Your maximum hand size is reduced by 2. When your turn ends, draw 1 card if you do not have cards in your grip equal to or greater than your maximum hand size. The First Directive forbids a bioroid from harming, or through inaction allowing harm to befall, a human being. First, the effect is generally useful. Free, clickless card-draw is something almost any deck wants. You can even turn it off if you don't want it, just by letting your hand fill up. Second, the downside is probably the most easily mitigated of all of the directives. There are quite a few cards now that give the runner extra hand-size. Public Sympathy, Brain Cage, [Origami](/en/card/06074]... even Theophilius Bagbiter, if you want to get crazy. The biggest issue is, of course, the influence cost - 3 is pretty steep. For decks that want to cycle cards quickly though, that may well be worth it. 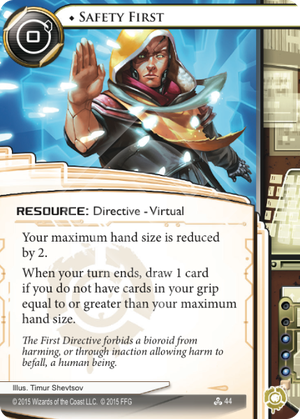 Special mention here goes to Apex - it seems like a particularly good fit for him, since it's a virtual resource (so he can actually use it) and his ID ability is fairly card-hungry.